Full feature ICE. 16 to 50 MHz. Emulation and trace ISA boards install in the Nohau® HSP box and connect to the PC via the LPTx port, or directly into your computer's ISA slots. No IRQ in your PC is used. Also, available in a USB Box interface. 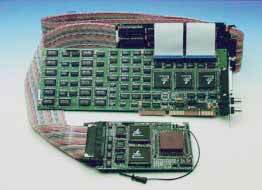 Optional 32K, 128K or 512K trace board. A wide range of optional trace buffers are available to fit any project and budget. Bondout chip is used for accurate emulation of both internal and external modes. Software updates are available from the web. The trace and triggers are confgured and accessible in real-time. No cycle-stealing.